In 1883 a tender was circulated for the design of the present church, “to have a spire, organ chamber, galleries and two vestries”. The walls were specified to be of brick and stone, the fittings of kauri and the size to accommodate 650 persons. The total cost was not to exceed £5,000. 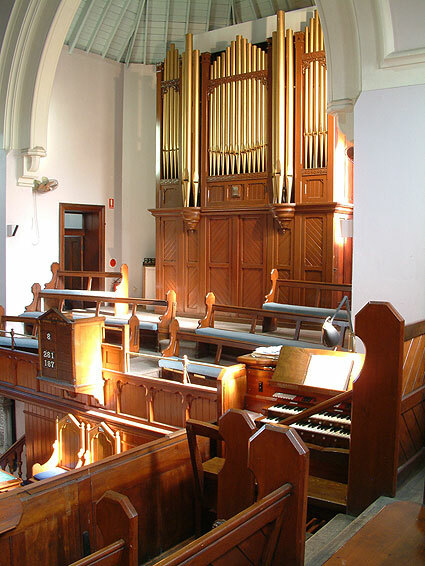 In 1905 the building was modified under the supervision of Messrs. D. Macrae & Son, of Redfern, the cost being covered by prominent Methodist layman, The Hon. Ebenezer Vickery, MLC. 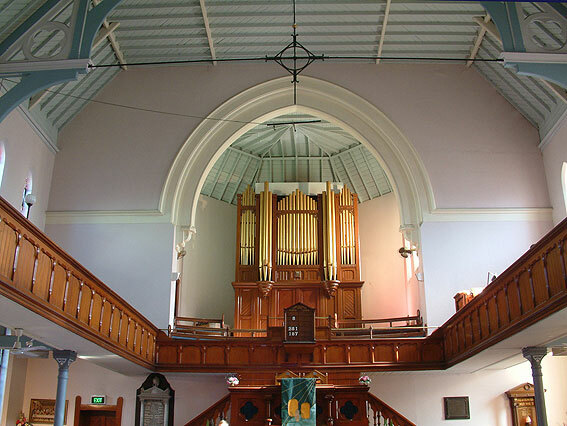 During this work the galleries were lowered by four feet, a false ceiling was installed and the organ gallery was made to project into the building by three feet. A contract was let to Peter D.G. Jewkes Pty Ltd in 1999 and in the following year the firm completed work to revise the specification, provide a new solid-state switching system (by A.J. and L. Taylor of England), improve the winding system through the addition of two new concussion bellows, rebuild the console, carry out pipe repairs and to provide a new Trumpet stop in place of the damaged Cornopean. (As the Noad console stopkeys were retained, the Trumpet is labelled “Cornopean”). 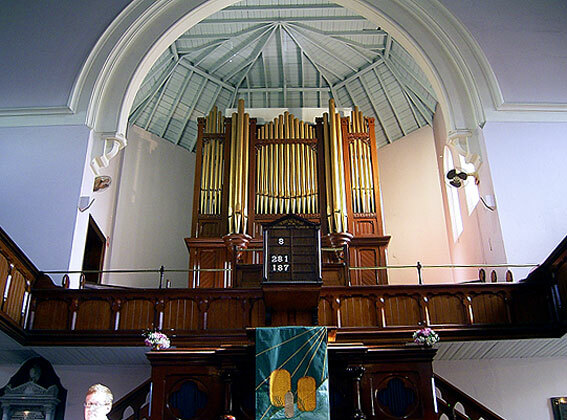 The Methodist denomination was absorbed into the Uniting Church in Australia in 1977. James Colwell, Illustrated History of Methodism in Australia. Sydney: William Brooks & Co., 1904, 334. Gloster S. Udy, Spark of Grace. Parramatta: Epworth Press, 1977, 14 and 173. The Weekly Advocate, 1 March 1879, 17. 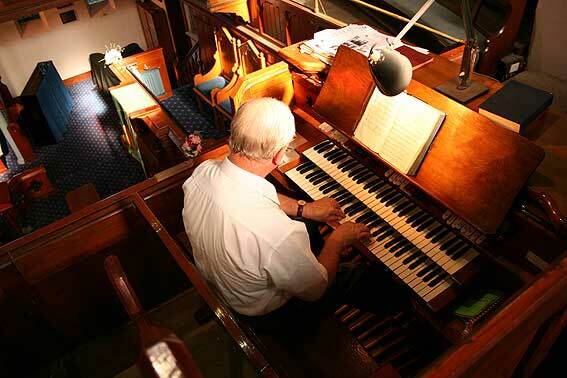 Parramatta originally had no pedal stops: the Bourdon was divided into treble and bass, the treble being labelled Double Diapason. Macquarie Street Church, Parramatta, The Methodist, 25 March 1905, 9. Kelvin Hastie, Organ Report No. 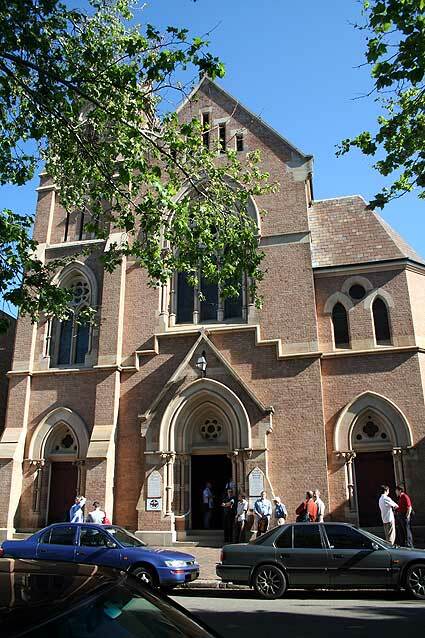 2 – Leigh Memorial Uniting Church, Parramatta. Unpublished report, September 1995.